Yarn: Trendsetter Yarns - Tonalita Example here in color 2349. 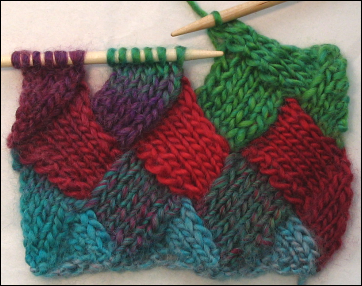 Photo of first triangle in the base triangle section of your scarf. Now work the two middle diamonds of Tier 1. 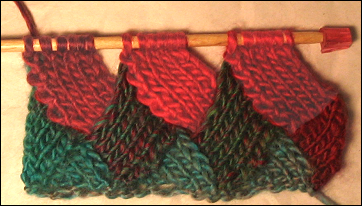 Row 1: (WS) With wrong side facing, pick up and purl 6 sts along the selvedge edge of the next triangle. Sl last st picked up onto the left needle and p2tog, turn. Repeat Rows 1 to 11 one more time to complete all both middle diamonds. Once both diamonds are done began working the right side triangle in the next section. Row 1: (WS) With wrong side facing, pick up and purl 6 sts along the selvedge edge of the next triangle or diamond, turn. Row 11: k2tog - Turn and transfer this st to the right needle. The remaining stitch will be counted as the first st picked up for the first diamond in Tier 2. 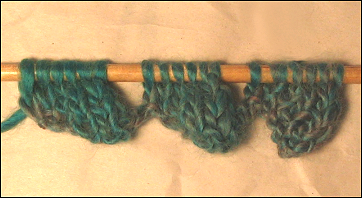 Row 1: (RS) With right side facing, pick up and knit 6 sts along the selvedge edge of the next triangle or diamond. Sl last st picked up onto the left needle and ssk, turn. Repeat Rows 1 to 11 two more times to complete three middle diamonds. Once the three diamonds are done you will start tier one again. Continue working tiers 1 and 2 until the desired length is reached. Before you begin the bind off triangles the last tier you work is tier one. Keep that in mind when you start thinking about coming to the end of your scarf. Photo of Tier One completed, your project should be on this tier when you are ready to begin your bind off triangles. 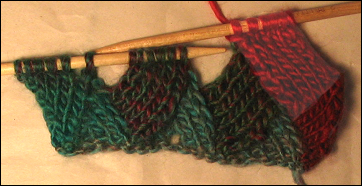 Row 1: (RS) With right side facing, pick up and knit 6 sts along the selvedge edge of the next triangle or diamond. For the first triangle only, the st remaining counts as the first picked up stitch. Slip last st picked up to left needle and ssk, turn. Row 10: purl sts in this section, turnRow 11: sl 1, ssk, psso, do not turn. The remaining stitch will count as the first stitch of the next triangle. 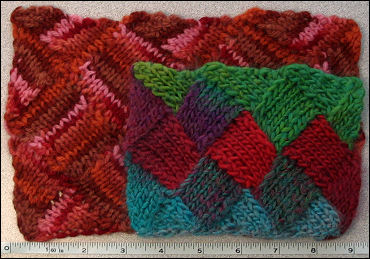 When all three triangles have been worked, bind off last stitch and weave in ends. You should have 6 stitches for each triangle at the end of each section with the exception of the right side triangle at the end of tier one – at that time you will have 19 stitches on your needle. There will be three sections of 6 stitches plus one which is the start of the three diamonds in Tier 2. When you are getting close to starting the bind off triangles keep in mind that the last section you will knit before starting the bind off is Tier 1, not tier 2. To create a gap free seam, count the stitches you intend to pick up from the bottom before you began to pick up. Most gaps are caused when you pick up at extra stitch at the top and skip the most important stitch which is at the bottom. Great job on the tute, though, it looks really cool. I love how it looks, hopefully I'll attempt this one day! You are so awesome! Everytime I read your blog I am amazed at your skills - whether baking, knitting, or teaching about knitting - and everything seems to come so naturally! You are one amazing otter, that's for sure. And I love the entrelace, love the look, love the feel, now must try for myself (thanks to the otter tutorial!). Great tutorial. Don't you love how entrelac works with ombre yarns?! What a lot of work you put into this tutorial! I've never been intrigued by Entrelac but now I know where to come should I get the bug. Thank you for the PDF version of the tutorial. I printed it out and everything...pretending that I might actually understand it and try entrelac again..the first time..the washcloth..did not go well. Plan B, fly in for semi-private lessons! You have very nice site! Do you mind if I do? I'd need one of the pictures on your blog post to lure people over to read the whole tutorial. Please feel free to say no if that's not okay with you (but doesn't everybody love their 15 minutes of fame?). Wow! 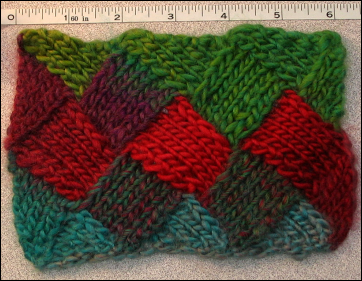 Entrelac tutorials have always looked so complicated to me, but you made it look so simple! Thank you so much for this. I'm a fairly new knitter and was dying to own one of the Quant headbands from the winter `08 Knitty. Your tutorial, and your tutorial alone made my dream come true. Thanks so much for making entrelac easy! This is a beautiful piece - I love the colours. Thank you for sharing your pattern. Its my next big project. Hey, I found this tutorial through craftster and started following it. Thanks, I've always wanted to be brave enough to knit entrelac! I noticed a slightly confusing instruction I thought you might want to know about/might help anyone else following it. On the Tier 1 Left Side Triangles row 11, instruction says "turn - end of left triangle - Do Not Turn" Obviously that first 'turn' is a mistake. Haven't got much further, but I guess the mistake could be repeated elsewhere. Anyway, sorry to bug. Hope that helps. Thank you so much for this tutorial. I have a case of Lorna Lace coming in. Lots of different sizes and colors. The two that this is just SCREAMING for is the Watercolor and the Rainbow so I will be using your tutorial to make scarves, headbands, stoles and socks. Thank you for taking all of the time and effort to put this together. Hello, Thank you very much for this useful and well-done tutorial. I have done an entry on my blog, giving the link here. Awesome tutorial! I did a knit along with you directions and am goign to share my new skills with friends ASAP. thanks! Thank you so much for sharing!!! I cannot wait to try it! Oops! Back to the subject at hand. Thank you SO hugely for the grand tutorial to entrailtangles. We have taken to calling it entrails tangles or "entrailtangles" but with the spiffy pictures and the put your right foot here and so on I can actually do this Entrelac thing, now if I can just fake saying it right! Happy day! I would be jumping up and down and dancing right about now if it wasn't 3 degrees outside of my cozy bed. I will leave my covers long enough to bow to the sun for you though, and wish you many happy returns of the knitting day and a tangle & guilt free endless stash. That said, I am back to my knitting with a big ol' smile on my face. Oh wow- thank you thank you thank you. YOu don't know how many times I've pulled out and started the Entrlac scarf over and over. I wish I would have found you weeks ago! You have an amazing tutorial. I was working on an entrelac scarf and was struggling after the first triangle. I had not done entrelac before and was convinced I was doing it wrong. Your pictures and explanations were just what the doctor ordered! I finished my first, second and part of the third row in one evening. It is a really cool pattern. Once again Thank you so so much for your tutorial! Your instructions are so much better than most I have seen. Thank you so much for creating this tutorial. I'm moving right along and should have a scarf in a few days. I've been dying to try entrelac so thank you for yet another excellent tutorials! I'm definitely a visual learner so your help is deeply appreciated! Thanks for this GREAT tutorial!!! thanks so much. This was really helpful. The PDF came across well and easy to follow. I am using Noro with silk blend for a lovely, irrestible scarf. All the gals at the knit shop are making a similar pattern out of the same Naro line of wool in different lot numbers. Your tutorial looks like just the key for me to try my hand on it. I am a novice knitter. I am not very skilled at reading patterns. At what point do you change colors? Where you pick up the stitches? THanks. Thank you for the clear 'splainin'. 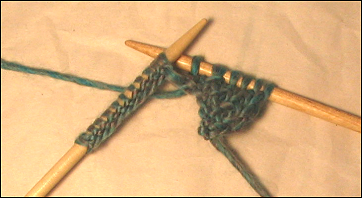 Question: if I'm knitting backwards so as to avoid the continual turning, what does the "pick up and purl" look like? Again, thanks! This pattern was extremely difficult for me and I consider (considered) myself a master knitter. Boo hoo..... I gave up after five or six tries. 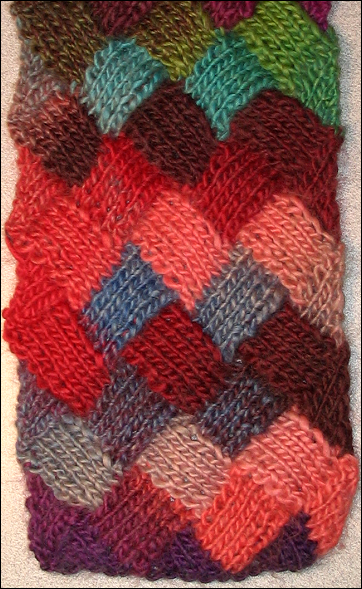 I have been entranced and intimidated by entrelac. I am now on my third tier thanks to this awesome tutorial. Wow, you make it look so easy! Thanks for the useful photos, I can't wait to experiment with this! i THINK IT IS SO COOL THAT YOU WANT TO SHARE YOUR PASSION WITH OTHER KNITTERS LIKE ME! THANKS SO MUCH FOR THE GREAT TUTORIAL. I THINK I WILL BE ABLE TO FOLLOW IT EASILY. Wonderful tutorial. Thank you so much. Thanks so much for this great tutorial. It made so much more sense (to me) after I saw the photos of each step along the way. Before today I thought entralac was way, way, way too advanced for a somewhat advanced beginner like me to try. 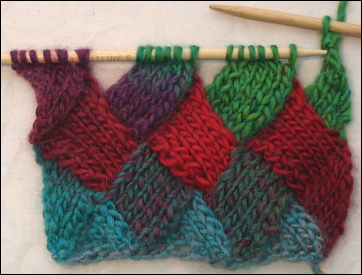 Now though, I will be much more likely to try a scarf using the entralac method... thanks for your fun tutorial. This has been an awesome scarf to make - you're tutorial was a great help. It's been a fun project to take and work on at basketball games - I get lots of comments, and young girls wanting to know more about knitting. Thanks! I'm the admin of the "Unfilodi Knit-House" Italian Blog-Shop and Forum. An user of ours took care of the Italian translation of this Tutorial for the benefit of other non-english-speaking users. The file now is in my hands, but before publishing it as a PDF file in our free download area of knitting patterns, manuals and tutorials under Creative Commons licence (only free user registration required to download), I'm asking for your prior permission to such publishing. Moreover, being it just a strict translation of your tutorial "as is", including photos, I would like to add to the translated PDF all the proper credits and links to your site. In case and after you would agree about publishing, please let me have at the pointed out email address both your permission and the specimen of the credits you like to be added. Many thanks in advance, have a nice knitting. I took instructions from this website and making a scarf now. I forwarded this to many friends. We are members of slcl knitting club. I have done both 8 & 6 st. scarves. Thank you for your way! All of a sudden I need you to clarify for me. PICK & KNIT OR PURL 6 sts. I was just picking them up and go do the next row. It is more to it then loop from the back to front, then yo and pull thur to back. AM I SUPPOSE EIIHER K OR P the st.? Waiting for your help. Very nice tutorial - thanks!!! Just got back from Stitches in Connecticut. I saw the Lady Elizabeth and decided I HAVE TO LEARN THIS. Well, we shall see. The pattern looks like I actually might be able to do it. I wanted to let you know first off I have a hard time with knitting (I have a difficult time following patterns) I tried that pdf you are linked to but I got confused. I followed your tutorial and it was wonderful. I have two tiers completed I am going to make it real long. thank you so much. Thanks for sharing very good tutorial...waiting for more.